Seattle Cascades face "most challenging season ever"
From a Seattle Cascades' press release: With each step taken on the field, every note played and every equipment move made by the colorguard, it is becoming increasingly apparent that the Seattle Cascades corps is facing its most challenging season ever. The Seattle Cascades rehearse under cooperative Northwest skies. Musically, from nuance to sheer power and from sustained passages to rhythmic brilliance, the book of Latin music by composers Piazzolla, Ginestera and Copland is extremely demanding. If marching at 194 beats per minute in the three-plus minute opener isn't challenging enough, by the end of the second chart the corps is spread from end zone to end zone. An unexpected ending will be Seattle's version of "shock and awe." From beginning to end, melodic, passionate and surprising will describe the 2003 production, "Danzon!" The 2003 show was recently retitled to more accurately reflect the five moods being depicted -- Celebration, Ritual, Passion, Tango and Fiesta -- rather than emphasizing the composers and the pieces being performed. There are other challenges this season too. New artistic staff members are finding ways to blend new technique and style into existing structure and tradition; the administrative staff is placing new demands on volunteers, parents, alumni and members alike, attaining financial goals and putting on the best Summer Music Games production the Northwest has ever seen; and an increasingly diverse membership coming from greater distances is adding another dimension to the corps' regional tradition. The color guard, after a two-month break for the winter guard season, rejoined the brass and percussion sections at the April camp. The musical sections have played the entire book, memorizing most of it. As of the end of the first of two May camps, drill has been learned for the first two charts. The famous Northwest skies, notorious for copious amounts of the wet stuff, have been cooperative, proving that the heavenly powers are indeed drum corps fans. While the corps is responding well to the show's difficulty, much work remains before the first competition in northern California on June 27. One camp remains this weekend. The Memorial Day camp is becoming increasingly popular and special with the local community. Parents and supporters are invited to attend the Cascade Youth Music Association's annual meeting where board members will be elected, the alumni-hosted BBQ, and a run-through of the show. 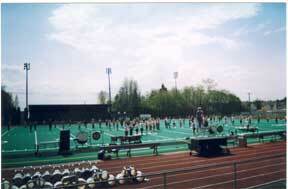 This will be the last time fans will see the corps locally before the Seattle show on July 5. In the meantime, however, everyone is anticipating "getting out of Dodge" for all-days in a quiet farming community south of Portland. Oregon's contented cows will never be the same. The Cascades are pleased to be endorsed by Premier Drums and will be performing on all new percussion equipment this year. Other endorsements include Zildjian cymbals, Vic Firth drumsticks, Remo drumheads, StylePlus shoes and colorguard equipment provided by The Band Shoppe. "Brass in the Grass," the corps' Seattle show at Husky Stadium on July 5, also will have new elements. Sponsors include Comcast, The Seattle Times, The Herald and KING-FM Radio. As a result, the drum corps activity will receive unprecedented Northwest media coverage. The show also will have three levels of tickets for the first time: $20 general admission for seating outside the 45 yard lines, premium seating between the 45 yard lines, and $50 gold tickets, which entitle fans to free parking, food and beverage service and exclusive seating in the stadium's Don James Center (used for the university's football donors). Another new sponsor is the DoubleTree Bellevue Center, which is providing a great room rate for out-of-town fans attending the show. For information, tickets and room reservations, visit the Brass in the Grass Web Site, or the Seattle Cascades' Web site. Finally, Cascades merchandise is now being offered on the DCI Web site, and the Cascades corps has changed its URL from seattlecascades.com to seattlecascades.org. If change is the essence of remaining exciting, new and different then the Seattle Cascades corps is at the forefront.